The International Service for the Acquisition of Agri-biotech Applications (ISAAA) launched its 2016 report titled Global Status of Commercialized Biotech/GM Crops: 2016. Two launch events were held on May 4 and 5, 2017 in Beijing, China. The media conference held on May 4, 2017 at China Wold Hotel was attended by some 40 journalists from Chinese and international news agencies. 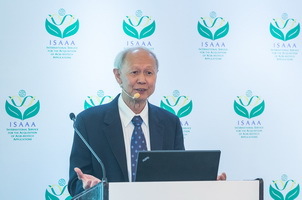 ISAAA Chair, Dr. Paul Teng, presented the highlights of the report. He stressed that the adoption of biotech crops increased to 185.1 million hectares in 2016 after the slight decline observed in 2015. ISAAA Senior Program Officer, Dr. Rhodora Aldemita, talked about the development and adoption of biotech crops in Asia. The following day, a seminar was held on May 5, 2017 at the Chinese Academy of Sciences, which was attended by 120 scientists, members of the academe, and students. Drs. Paul Teng and Rhodora Aldemita presented the highlights of the ISAAA report. Mr. Zhang Xianfa from the Ag GMO Division of the Ministry of Agriculture discussed the status of Chinese biotech crops regulation and development. The participants signified their interest in the adoption of more biotech crops in the country to benefit not just the farmers and their families, but also the consumers. The events were organized in cooperation with China Biotechnology Information Center, Chinese Academy of Agricultural Sciences, and the Chinese Biotechnology Society. For more information about the events, send an email to knowledge.center@isaaa.org. The ISAAA report is downloadable at the ISAAA website. -Published by ISAAA. See original article link here.